We are providing a proposal from the United Pool and Spa Association to give plan review for commercial pools back to the Florida Department of Health. For the background on this proposed legislation, please note the information at the bottom of this post. There are 37,000 public pools and spas in Florida that provide an integral contribution to the Florida economy. These pools and spas require regulation to ensure proper construction and operational oversight to maintain health and safety standards. Over the past 91 years, the Florida Department of Health (DOH) has provided construction plan review (for new construction and modifications), routine site inspections, and code compliance enforcement for bather health and safety. Their code has been recognized nationally by the CDC as a model code for safety and sanitation. In April 2012, HB 1263 was passed and enacted, which eliminated the DOH from the construction plan review process. This task was switched solely to the local municipal building departments. While the building departments are qualified to assess the construction elements of a pool or spa, special knowledge and training was not provided for the evaluation of the health and safety items that are a vital part of a pool/spa proper operation (e.g. disinfection systems, safety equipment, etc.). Further, the DOH, while responsible for the oversight of the operation for the life of the pool/spa, is not involved in the pool/spa until after the construction is completed and the pool owner applies to the DOH for an operating permit. • Newly constructed pools and spas are being permitted built improperly, failing DOH inspections and being denied operating permits. Construction mistakes require either a DOH Variance Board hearing, or the mistakes must be corrected before a DOH operating permit is issued. -Variance requests delay pool openings, thus causing hardship to pool owners, and loss of revenue for owners of income-producing pools (e.g. health clubs and hotels). -Remedial repairs to unapproved variance requests result in further delays and costs to pool owners. • Municipalities’ liability risk exposure has increased significantly. • Florida pool and spa bathers have increased risk for waterborne illnesses, injuries, and death. • Responding to concerns and complaints from pool owners, commercial pool builders, engineers, and manufacturers, the United Pool and Spa Association (UPSA) has offered training and advice to building department officials throughout Florida. They have developed Continuing Education training classes for building officials in the areas of Plan Review and Final Inspection. While they have been a help and well received, they cannot transfer the 91 years of experience garnered by the DOH in two 2 hour classes. • While this experience still resides with the DOH, it will soon be lost as the qualified people find other positions. • Require a copy of the new construction or modification plans be sent to the DOH to review at the time of submission to the municipal building department for a permit. This will allow mistakes to be corrected before the pool/spa is built rather than afterwards when it becomes very costly. It will also make the DOH aware that a pool is being build and will need an Operating Permit. • Notify the Contractor that an Operating Permit is required before the pool/spa can be used and require a copy of the application for an Operating Permit be included before receiving a Certificate of Completion. • Allow DOH input in any future code modifications to ensure proper operation for the life of the pool/spa. 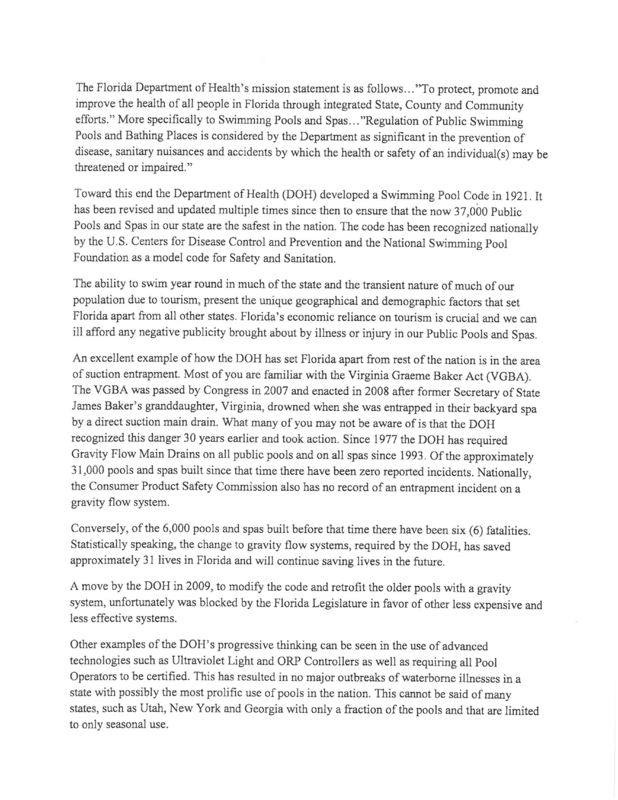 The DOH has a significant impact on the safety and health of Florida public pool bathers. They must be involved in the plan review process before construction of any public pool or spa. Toward this end the Department of Health (DOH) developed a Swimming Pool Code in 1921. It has been revised and updated multiple times since then to ensure that the now 37,000 Public Pools and Spas in our state are the safest in the nation. The code has been recognized nationally by the U.S. Centers for Disease Control and Prevention and the National Swimming Pool Foundation as a model code for Safety and Sanitation. The ability to swim year round in much of the state and the transient nature of much of our population due to tourism, present the unique geographical and demographic factors that set Florida apart from all other states. Florida’s economic reliance on tourism is crucial and we can ill afford any negative publicity brought about by illness or injury in our Public Pools and Spas. An excellent example of how the DOH has set Florida apart from the rest of the nation is in the area of suction entrapment. Most of you are familiar with the Virginia Graeme Baker Act (VGBA). The VGBA was passed by Congress in 2007 and enacted in 2008 after former Secretary of State James Baker’s granddaughter, Virginia, drowned when she was entrapped in their backyard spa by a direct suction main drain. What many of you may not be aware of is that the DOH recognized this danger 30 years earlier and took action. Since 1977 the DOH has required Gravity Flow Main Drains on all public pools and on all spas since 1993. Of the approximately 31,000 pools and spas built since that time there have been zero reported incidents. Nationally, the Consumer Product Safety Commission also has no record of an entrapment incident on a gravity flow system. Conversely, of the 6,000 pools and spas built before that time there have been six (6) fatalities. Statistically speaking, the change to gravity flow systems, required by the DOH, has saved approximately 31 lives in Florida and will continue saving lives in the future. A move by the DOH in 2009, to modify the code and retrofit the older pools with a gravity system, unfortunately was blocked by the Florida Legislature in favor of other less expensive and less effective systems. Other examples of the DOH’s progressive thinking can be seen in the use of advanced technologies such as Ultraviolet Light and ORP Controllers as well as requiring all Pool Operators to be certified. This has resulted in no major outbreaks of waterborne illnesses in a state with possibly the most prolific use of pools in the nation. This cannot be said of many states, such as Utah, New York and Georgia with only a fraction of the pools and that are limited to only seasonal use. In 1998, the Building Code and Health Code were merged to form the Unified Building Code. At that time, plans for new pool and spa construction and modifications to existing pools and spas were fist submitted to the DOH, where they were reviewed for all the components covered by the Health Code. The plans were then sent to the local municipal Building Department, where they were reviewed for other issues pertaining to the Building Code such as the deck and the bathrooms. A Building Permit was subsequently issued, and the pool was built. After the final inspections, a Certificate of Completion was issued by the Building Department and an Operating Permit was issued by the DOH. There was a lot of overlap; however this worked very well for years giving the process continuity and a system of checks to help prevent oversights and costly mistakes. Then in 2012, HB1263 passed the Legislature and became law. The DOH was stripped of many of its duties in an effort to cut the budget. These duties were wide-ranging, from closing the Tuberculosis Hospital in Ft. Lauderdale to eliminating the statewide septic tank mandate passed in 2010. In regards to swimming pools though, it eliminated the DOH’s responsibility for reviewing construction plans. With a stroke of the Governor’s pen on April 25, those duties were transferred solely to the municipal Building Department. Incredibly, there was no transition period and no education for the Building Inspectors as to what the DOH’s responsibilities were. More incredibly, the DOH, who would be responsible for their proper operation, consistently safe water quality and functionality, would have no say in how they were built. Ninety-one years of experience was eliminated from the process. All of this, in a state where as was previously mentioned, swimming pools play such a large part of people’s everyday lives and our economy. Unfortunately, this change has not reduced costs to the state or the pool industry; to the contrary, it has increased them. It has brought plan reviews to a crawl while Inspectors try their best to learn “on the job”, the complexities of a pool construction plan, causing delays and resubmissions of plans that is unnecessary. It has led to an increase in the number of Variances being granted for things that would have never made it through the plan review process before. It has also dramatically increased the liability for the municipalities which will be detailed later. 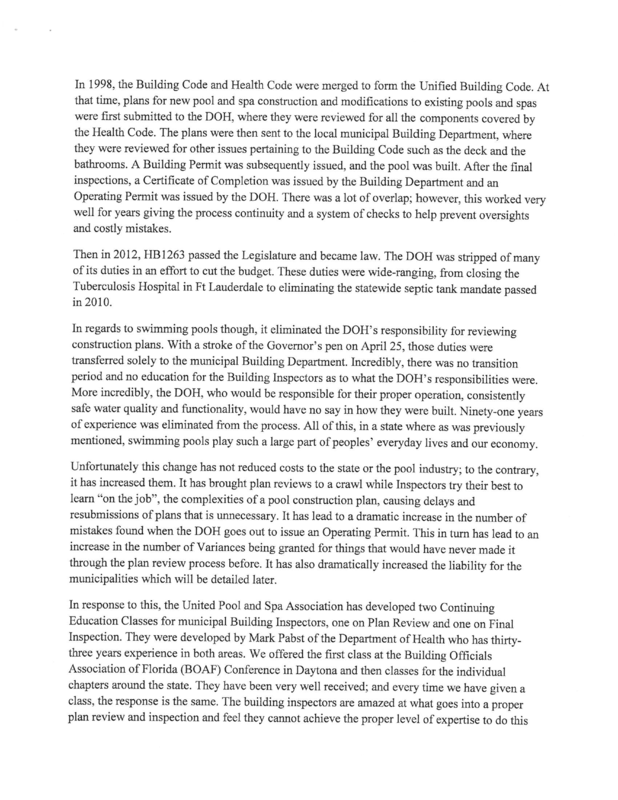 In response to this, the United Pool and Spa Association has developed two Continuing Education Classes for municipal Building Inspectors, one on Plan Review and one on Final Inspection. They were developed by Mark Pabst of the Department of Health who has thirty-three years experience in both areas. We offered the first classes for the individual chapters around the state. They have been very well received; and every time we have given a class, the response is the same. The building inspectors are amazed at what goes into a proper plan review and inspection and feel they cannot achieve the proper level of expertise to do this job with a couple of two (2) hour classes. All agree that the things they are looking for and the reasons for their importance clearly fall under the purview of the DOH. Then, when informed of the liability incurred by being the “Engineer of Record”, having signed off on the plans, they all agree the would like to have another set of eyes and the expertise and experience the DOH brings to the table. Consider the Connecticut entrapment drowning case of Zachery Archer Cohen from 2007 that was settled in 2011 for 40 million dollars. The Pool Builder, who was actually arrested for manslaughter in the case, was responsible for 11 million dollars. The equipment manufacturers were responsible for 15 million dollars. The Engineering Firm and the General Contractor each settled for 2 million dollars. The remaining 10 million dollar judgment was paid by the Tow of Greenwich because their building department had approved the plan the way it was designed. Why would the state burden the local municipalities with such a liability? Neither the Building Inspectors not the DOH want to see the DOH removed from the construction Plan Review process. The Pool Owners, General Contractors, Aquatic Engineering, Pool Builders and Manufacturers are also of one voice regarding this change. The change made during the 2012 Legislative session has driven up the cost and time it takes to build a pool or spa. It has reduced the level of safety in the pools. It has increased the liability on our Municipalities dramatically. It has absolutely no benefit and is only a detriment. We recommend that a copy of all new construction and modification plans be sent to the Department of Health upon submission to the Building Department for a permit. We also recommend that the entity submitting the plans (Engineer, Owner, and Contractor ECT) be made aware that they will have to obtain an Operating Permit from the DOH before opening the pool/spa. In addiction that it will be a requirement to get a Certificate of Completion that the Operating Permit has applied for. Currently there are pools/spas being operated without Operating Permits and the DOH only receives a plan when they show up to do the inspection. It is foolhardy for the DOH to be on site after the pool is built, only to discover any mistakes at that point. It is imperative to our industry to be able to utilize the DOH’s experience and expertise on the front end of the construction process. The experienced people who were previously involved in construction plan reviews are still at the DOH performing other duties, but this will not always be the case. If we do not act quickly these qualified people will move on and this valuable experience will be lost. The United Pool and Spa Association (UPSA) supports Governor Scott’s efforts to reduce the costs of doing business in Florida, but not if it sacrifices safety. We are very proud of our industry and feel we build the safest pools and spas in the country. The Florida Department of Health has played a lead role in that, and we believe it should be allowed to continue. 1) What is House Bill 1263? This is the Department of Health reorganization bill that includes significant changes to the public swimming pool statute, Chapter 514, Florida Statutes. The bill is now listed as Laws of Florida (LOF) 2012-184. 2) When is HB1263 effective? Governor Scott signed the bill on April 27, 2012, and it became effective after filing with the Secretary of State on April 29. Rather than listing a specific date as some new laws do, it became effective “upon becoming law”; and his signing the bill makes it law. 3) What is the main change for Florida’s Department of Health and the Building Departments? The statute shifts responsibility for oversight of initial public pool construction from the DOH offices to the local Building Officials. These Officials will now process the engineered plans and applications to issue construction permits for public pools in accordance with Section 424.1 of the Florida Building Code. 5) What role will the County Health Departments (CHDs) have with public pools? They will issue the operating permit initially and again annually. Engineering CHDs and DOH regional engineers will conduct the initial operating permit inspection. When public health incidents occur, all the CHDs will investigate and mitigate the cause. 6) Shall DOH engineering offices contact their building department(s) and vice versa? Yes, it is vital for a seamless transition between jurisdictions to discuss the flow of information, the documents and permits, the overlap of the jurisdictions, and the Building Plan Reviewers and Inspectors training by DOH pool experts. 7) What will all DOH engineers do with plans and applications they have in house? We cannot legally issue an approval for construction plans after Sunday, April 29. DOH engineers will contact the applicant and return all submitted documents if requested, or they will package and send the documents with recommendations including marked plans and the review checklist to the jurisdictional building official. 8) What will all DOH engineers do with plans and applications received after April 29? DOH cannot legally process them. DOH staff will ask the applicant if they want their plans, applications and fee returned to them. If the applicant can provide forwarding information, and the applicant requests it, DOH will forward the documents to the jurisdictional building department. Department of Health Implementation Plan for HB 1263, Public Swimming Pools and Bathing Places, Chapter 514, FS, LOF 2012-184, Version May 8, 2012Section 424.1, Public Swimming Pools. If satisfactory, they will issue the construction permit and conduct necessary construction inspections per Chapter 553, FS, as the pool is built. Upon completion, they will conduct a final inspection, and after approval, they will provide a copy of the approval letter to the CHD. 10) Will the DOH engineers assist the Building Departments? Yes, coordination with the DOH staff is anticipated for this final building department inspection, and during the earlier plan review stage. Staff training materials and procedures for plan review and inspections will be provided to Building Officials. 11) Will the Building Department approved plans be shared with the CHDs? Just like the DOH-approved plans were given to the Building Department by the applicant, the applicant will now provide the jurisdictional CHD a set of the Building Department-approved plans with the application for an operating permit. 12) What will the County Health Department (CHD) engineers do with the form DH918 (new) Application for a Swimming Pool Operating Permit? The engineering CHDs will receive the completed Application with appropriate fee and documents (Building Department-approved construction plans or as-built plans with changes). The engineering CHD will review the application for completeness, and statute and rule compliance, and conduct the initial operating permit inspection. Form DH916, the previous DOH application for operating permit, may be processed with plans that were originally approved by DOH. All ten engineering CHDs* currently serving neighboring CHDs* will continue to provide these services into the future. 13) What is the fee for the initial operating permit application? The Initial Operating Permit (IOP) inspection fee ($150) will continue to be used. Local CHD fees may be added. 14) Will those CHDs that provide pool engineering services to other CHDs continue? Yes, the engineering services associated with the review of application for an IOP and an associated inspection may continue to be performed. Similarly, the IOP services for the 45 non-engineering CHDs** will be provided by the DOH program office if requested by any of those 45 CHDs**. 15) *The following listed engineering County Health Departments* will provide IOP inspection assistance to the (listed non-engineering CHDs), and engineering assistance to their Building Officials upon request: Broward, Collier, Escambia (Santa Rosa, Okaloosa, Walton, Holmes, Washington, Bay), Lee (Charlotte), Miami-Dade, Palm Beach, Pinellas, Polk (Sumter, Highlands), Sarasota (Manatee, Hardee) & Volusia (Flagler). 16) ** The remaining 45 counties’ CHDs and their Building Officials will be assisted by the DOH regional swimming pool engineers upon request. The new form DH918, Application for Swimming Pool Operating Permit, (and fee and documents) shall be submitted by the applicant to the non-engineering CHD for new pools in these counties to obtain the IOP inspection. 17) Will CHDs still invoice the pool owner for their annual operating permit? Yes, after the pool operation is approved for initial use, each of the 67 CHDs will invoice their respective pool owner for the annual swimming pool operating permit. 18) Are there permits for public pool resurfacings? No, The 67 CHDs, under the DOH rule 64E-9.005(2), FAC, manage resurfacings without a modification permit, and will continue to with only the required contractor notification and CHD inspection. CHDs will continue to handle any changes to public swimming pools not deemed a modification using the definition of modification per the DOH rule and the FBC at 424.1 and 424.1.10. 19) Who will permit a modification to a public pool? The Building Department will permit modifications as the construction authority. This type of permit should be closely coordinated between the two Departments. 20) Who will deal with unpermitted public pools? The CHDs will take necessary compliance actions to close and/or issue an operating permit. The Building Department may be involved to issue a construction permit for modifications. 21) Who will permit a bathing place construction or modification? The Building Department will permit original construction and modifications as the construction authority. This type of permit should be closely coordinated between the two Departments since there is very limited information in 424.1. 22) Will the Governor’s Swimming Pool Advisory Board continue to hear variances at DOH? Yes, however they will not hear pre-construction variance requests dealing with construction aspects, as these are now the building officials’ jurisdiction. There is no other change in the current DOH variance process. 23) Will DOH continue to assist with pool design calls from private professional engineers (PE)? Yes, the Florida building code at section 424.1 is identical to the plan approval portions of DOH’s rule, 64E-9, FAC; and so the DOH engineers may discuss these details with a PE. DOH staff will alert the private PE that the Building Official will be the final reviewer. 24) Will the DOH rule 64E-9, FAC be revised? Yes, a notice of proposed rulemaking will be initiated soon. program staff, and second, DOH Central Office is 850-245-4240 in Tallahassee. The Florida Department of Health wanted to share some information with you about a change to s. 514, Florida Statutes, that has a significant impact on local building officials. We really appreciate your help getting this information to all the local building officials in your areas. After extensive discussion by DOH legal staff including some County Health Department (CHDs) attorneys and DOH leadership, we have clarity as to the impact of the changes to s. 514, Florida Statute, as related to the public swimming pool program. A. DOH is responsible for setting the standards for only sanitation and safety for public swimming pools and public bathing places. Chapter 4, section 424, in its entirety. b. DOH operating permits are still required for public swimming pools. Application to DOH for operating permits is still required. Operating permits require annual renewal. c. DOH operating permits may be transferred from one name or owner to another. The new owner shall apply within 30 days after such a change. d. DOH may take enforcement against public swimming pools that present significant risk to public health by failing to meet sanitation and safety standards, so no change from current procedure . 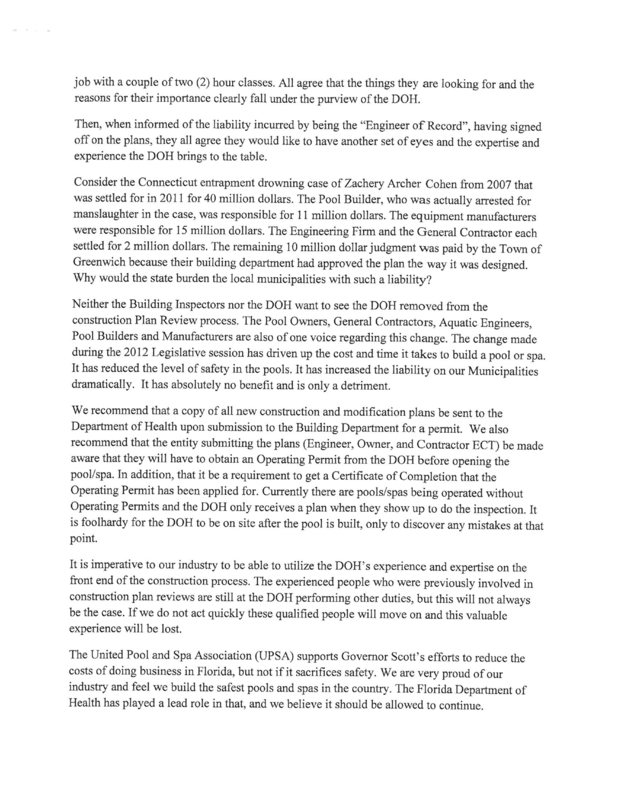 WHAT ACTIONS ARE BEING TAKEN by the DOH Program Office: We have had discussion with the Florida Building Commission (FBC). This commission has formed a new Swimming Pool Technical Advisory Committee (TAC) to write building code pool rules into the FBC at chapter 4 section 424. DOH will be represented on this TAC. We will work to support and assist the FBC during the 2013 Florida Building Code update process.  We will develop and offer training to the local building officials as they take on their new responsibility with regard to applying DOH sanitation and safety standards during construction plan permitting and construction inspection.  We will work with the DOH Office of Communications to notify the affected public of the change in responsibilities.  We will work on revision to chapter 64E-9, Florida Administrative Code, to align with the law. review of the applications for new public swimming pool operating permits and to perform the ‘first inspection’ to assist with issuance of the first annual operating permit for these facilities.  We hope to continue to provide engineering expertise to CHDs with regard to hydraulics, water treatment and safety.  It will be very helpful for CHDs to contact your local building officials to alert them to the change and help the transition. This will help even before formal correspondence is sent from the program office. Your local engineers and commercial pool contractors should be contacted as well. The program office will contact the contractors associations.  Assist with the implementation plan development. There will be decisions required that affect CHDs available resources so input from the CHDs will be greatly appreciated.  Those CHDs with engineering staff should begin the process turning over the applications for public swimming pool construction plans to local building officials that are new or in process of being reviewed as well as those construction plans that have been approved but construction not yet completed.  We are hoping that CHDs with engineering staff will have the financial ability to retain some staff to assist with review of applications for new public swimming pool operating permits and to perform the first inspections that require expertise in hydraulics, water treatment and safety.  We will handle existing variances that are in house in DOH, and DOH legal staff will review new request for applicable. If not within DOH authority these will be sent to local building officials.  Prepare for the transfer of the responsibility from DOH to local building officials to review public swimming pool construction plans and issue construction permits and perform construction inspection for all aspects of the Florida Building Code, chapter 4, section 424, including the hydraulics, water treatment and safety that had previously been performed by DOH engineering staff.  Assist with notification of the impacted industry, i.e., design engineers and contractors.  Attend training, if at all possible, as offered by DOH. HB 1263 was signed into law today. Therefore, we look forward to working with the CHDs and local building officials on the implementation of the changes required by law. Please let us know if you have questions. Thank you for your attention to this change in responsibilities under the law and helping us get the word out. We look forward to working with you to ensure public swimming pools are constructed in a manner that protect the public health and welfare. PLEASE NOTE: Florida has a very broad public records law. Most written communications to or from state officials regarding state business are public records available to the public and media upon request. Your e-mail communications may be subject to public disclosure.